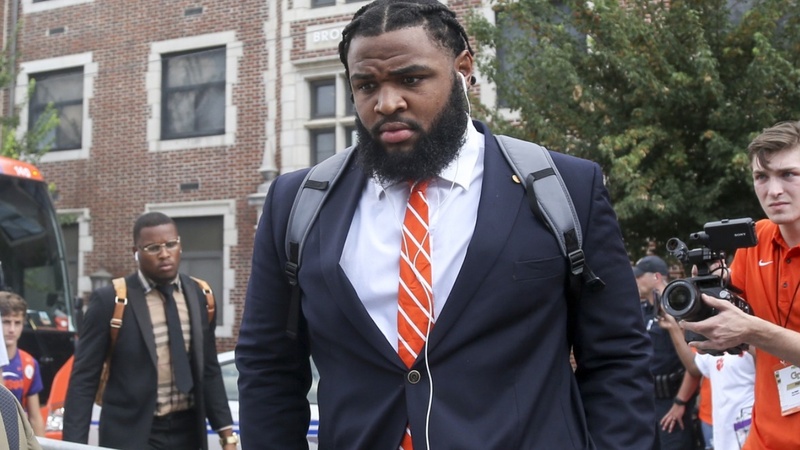 NEW YORK — The National Football Foundation & College Hall of Fame announced Tuesday that Clemson defensive lineman Christian Wilkins has been named the recipient of the 2018 William V. Campbell Trophy, which annually recognizes an individual as the best football scholar-athlete in the nation. In addition to winning the Campbell Trophy, Wilkins was honored as the fourth Clemson player all-time to be selected to the NFF Scholar-Athlete Class, joining quarterback Jimmy Bell (1964), quarterback Steve Fuller (1978) and center Kyle Young (2001). Candidates were seniors or graduate students in their final year of playing eligibility, had a GPA of at least 3.2 on a 4.0 scale, had outstanding football ability as a first-team player or significant contributor and had demonstrated strong leadership and citizenship. Head Coach Dabo Swinney was among the Clemson contingent on-hand in New York to see Wilkins become the first Campbell Trophy recipient in program history. All finalists for the honor received an $18,000 postgraduate scholarship. By virtue of being selected as the award winner, Wilkins’ postgraduate scholarship was increased to $25,000. "It's the epitome," Swinney said of what the Campbell Trophy means for a student-athlete in a press conference on Nov. 20. "I've been to that banquet so many years up in New York and I've always said, 'One of these days, I hope we can have a player on that stage.' I'm so excited about that award because it's not just football. And that's exactly who he [Wilkins] is. It's been amazing to watch him for four years." In addition to his prolific on-field accomplishments throughout a career that already includes multiple All-America and All-ACC selections, Wilkins has also excelled academically in his time at Clemson. Last December, he earned his degree in communications, becoming the first scholarship Tiger football player to graduate in two-and-a-half years. He is currently pursuing a graduate degree in athletic leadership. Wilkins has also been a staple in the Clemson community in both professional and volunteer roles. Last offseason, he worked as a substitute teacher in local schools, citing his desire to provide inspiration and guidance to young students. In addition, he has volunteered his time and efforts for service projects such as Habitat for Humanity, the Clemson Miracle Fundraiser, Colleges Against Cancer Relay for Life and the “Kicks, Cleats, Kids” initiative, among others. Formerly known as the Draddy Trophy, the award is referred to by some as the “Academic Heisman.” Included below is the list of the award’s recipients since its inception in 1990.